Last Wednesday, “TF” (and her equally gorgeous and skinny sis, “MF”), as promised, saved me a ticket to Fashion Week (Spring/Summer ’09). Since it’s my first time to watch a runway show, I was super excited. In fact, just so I could dress and look the part, umuwi ako nang maaga, nagkalat ng damit sa kama, nag-last minute change of outfit plan at nag-make up-make up’an. Before driving to the venue (SMX Convention Center, Mall of Asia Complex, Pasay City), I picked up Nicki (MF’s designer friend) first. Because of my traumatic EDSA traffic experience, I took an alternative route (Shaw–V. Mapa–Prince Court Motel shortcut–Pandacan Fly-Over–Pandacan–Otis–Taft–Roxas Blvd.) Medyo nag-freak out si Nicki dahil bigla akong kumaliwa sa Motel pero hindi naman nag-pahalata, hehehe. Although mas malayo yung biyahe, wala namang traffic so okay lang. We arrived at the venue at exactly 9:00 PM, sakto sa call time ni “TF” (ewan ko ba kung bakit may call time kami eh hindi naman kami rarampa, wish ko lang). Since we have time to kill, we spent it looking for okray worthy people (this is what I really came for, after all, that’s what fashion’s about). Haaayy, ang dame! Pero ang dami ding fab! While making lait (criticize) the people passing by, I bumped into Barbie, an old friend from UST who’s currently the head make-up artist for Maybelline. For one brief moment, probably because of my surroundings, I wished I had her talent and her job. I secretly wished that I could also transform and change people’s looks. Anyway, makalipas ang sampung taong (as in 10 years in my 3 inch stilletos!) pagtayo at pag-hihintay sa hallway, pinapasok din kami sa wakas. We got good seats (Section 8, Row C, seat nos. 3 to 7), kaya lang, when we got there, may mga mokong na naka-upo. Grabe, ‘di ko sila kinaya. It took them 5 minutes to leave their seats and only after we (este, I pala) almost made a scene. Imagine, kahit sinabihan na sila nung usher na the seats are reserved for us, ayaw pa rin. Worst is the guy sitting in “MF”‘s chair, he wouldn’t budge kahit anong parinig. When I told him, he should get off unless he wants “MF” to sit on his lap, it took him two more minutes before he stood up. The nerve! Akala ko only girls will do everything in the name of fashion, mas grabe pala ang mga wanna be models, kaazar! Jeffrey Rogador’s Collection — walk walk walk — clap clap clap…. Nice trousers. I’ll buy one for my guy. Ooops, wala nga pala akong guy. I’d better find one, fast! Jerome Lorico’s Collection — walk walk walk — clap clap clap…. Ralph Ng —walk walk walk —clap clap clap…. Loved the black finale dress! After 30 minutes, the show’s over. Kaazar! Super bitin! Yung mga models kasi, ang bibilis mag-lakad, hmmph! ‘Di bale, may next time pa naman. 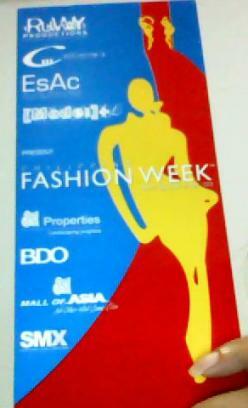 Babawi ako, umaga pa lang nasa SMX na ako, I’ll gatecrash the shows of all the popular designers. Sinong sasama? “A”, you have to come. Mahirap mang-lait mag-isa. Wala akong ma-she-share’an. “G”, you have to come with me, just in case mahuli ako at kailanganin ko ang serbisyo mo.